s took me to see my first panto on tuesday. if you're british, you know exactly what i'm referring to. panto = pantomime = mime = marcel marceau ? where does audience participation fit into a silent performance?! pantos, as they're generally known over here, are not a great choice if you're looking for a quiet night out. you'll be surrounded by the under 5-foot tall crowd shouting out helpful tips to the hero (he's behind you! ), booing the villain, and occasionally bouncing up and down in their seats like baby kangaroos. good fun! we went to the new wimbledon theatre to see henry winkler play hook in peter pan. that's right: the fonz! 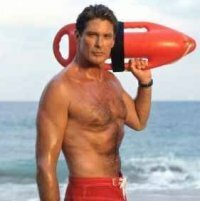 they had actually booked david hasselhoff earlier in the year, but he pulled out over the summer in a double-booking scandal that made front page headlines (in the local paper, ahem). gotta say, though, i thought fonzie was perfect for the role. the hoff may rule the beach, but the fonz reigns over the seven seas.